If you've been into tarot for even just a few years, you've seen the name Barbara Moore. Here's a link to her author page on Amazon. The list of titles she's written for the tarot world is not complete on Amazon's listing. Which is a nod back to Barbara, because she's not one to brag about herself. If that were MY author page, I'd probably have my 3rd grade essay listed on there...haha. Anyway, Barbara is a mucky muck at Llewellyn. She's THE gatekeeper if you want a tarot product published by Llewellyn. If she doesn't think an idea has legs, it doesn't go up to the Powers That Be for approval. She would never tell you this, but she's a goddess in the tarot world. She's also a fashion maven, quite beautiful and admirably slim despite her love of buttered popcorn and cupcakes. AND she likes my deck!!! Enough that she blogs about it!!! Now a skeptic would say "of course she blogs about it, doofus. She's paid to. She HAS to promote your product and act excited about it." But that's not the way it works at Llewellyn. Certainly she would never deride anything she brought to the market. But she only has to use it and like it if she uses it and likes it. And when I thanked her for using my deck in her blog, she said, "Tierney, I'm going to be using it a lot. Because it's awesome and I can use it with any deck." 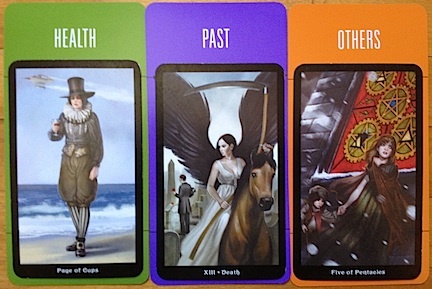 Barbara has featured the Deck of 1000 Spreads a few times in her blog. You can see three other posts here, here and here.